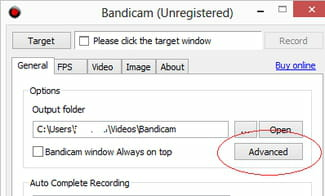 Bandicam - How to display the FPS in your video captures? In the "General" tab, click on the "Advanced" button. A new dialog shall be displayed, select the "General" tab. 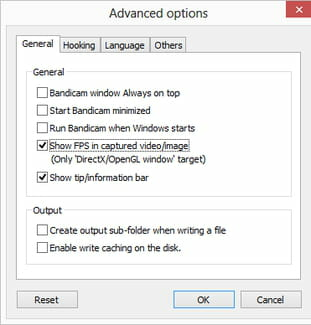 Check "Show FPS in captured video/image (Only 'DirectX/OpenGL window' target)". Published by deri58. Latest update on December 4, 2013 at 08:33 AM by jak58. This document, titled "Bandicam - Display the number of frames in the recorded videos," is available under the Creative Commons license. Any copy, reuse, or modification of the content should be sufficiently credited to CCM (https://ccm.net/).